All our costumes are unique, high-quality, and very detailed! We never use off-the-rack packaged costumes. Most of our costumes are designed and sewn by Robin! A costumed character doing face painting, balloons or whatever, is a great way to add an extra fun and festive atmosphere to your event! Also GREAT for photos. Don't see a costume that fits your theme? We always do our best to dress appropriately to your theme, even if we do not have a full-fledged costume which will suit your party. Pricing for costumed characters: Add $25 to party total, to add a a costume. Same costume fee no matter how many hours. For costumed meet and greet, call or text for pricing. Also available: Costumed Character Singing balloon deliveries! Want to make someone's day extra special? Surprise them at work, school or home with a visit from a costumed character! Robin will arrive at their door or desk in costume, bearing an incredible balloon creation, and will sing them a special song! Average visits are about 15 minutes. $85 base fee, travel may be extra, call or text for an estimate. Avast there! 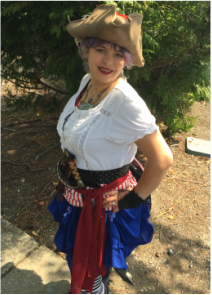 Captain Robin Blackbird will bring a festive salty air to your Pirate or Nautical party or event! Perfect for your Christmas party or Holiday event! Hollybelle can paint faces, make balloon sculptures, or create sparkly glitter tattoos, all in lovely holiday designs! Also fun for meet and greet and photos! This outfit is lots of fun for Steampunk, Video Gaming, Anime, or Historically themed events!